Top 5: History-making night Watch highlights from Collingwood's round four AFLW match against the Western Bulldogs, presented by Collingwood Media and premier partner CGU Insurance. With her dreadlocks and her uncompromising attack on the contest, it’s hard to miss Collingwood midfielder Lauren Tesoriero on the footy field. You just have to look for the player at the bottom of every pack. The 30-year-old’s multi-sporting career has journeyed from her roots in Mount Evelyn, to the country town of Yea, to across the globe in Ireland, before bringing it back full circle to play footy at the Holden Centre. And one thing has always remained the same – Tesoriero is one tough athlete. “I learned how to play footy from my brothers in the backyard. They’re pretty tough in the Yarra Valley. I didn’t have a choice to be honest – it was either be tough, or get hurt,” Tesoriero told Collingwood Media this week. Growing up in a small town in the Yarra Valley, a 10-year-old Tesoriero dreamed of playing football for her hometown club. After helping out around the club wherever she could – including boundary umpiring and running water – a family friend convinced her parents to let her play the last two games. But with no pathways available to continue to play footy, the hard-hitting midfielder-forward turned her attention to basketball and netball. As a standout netballer, Tesoriero played at representative level for the Mount Evelyn Netball club, and later played for the North East Blaze in the Victorian Netball League. In 2005, as an 18-year-old, she started playing senior women’s football at the Yarra Valley Cougars. One year on, Tesoriero was chosen for the Victorian state football team, and would travel to Ireland to represent Australia in the International Rules Series with current Magpie teammates Moana Hope, Meg Hutchins and Penny Cula-Reid. After returning from the trip, the former netballer decided to move to the Victorian Women’s Football League, where she’s played for the Eastern Devils on and off since. But after rupturing her ACL a few years ago, she turned her sights back to netball, but this time, in a coaching role. “Kate has become my netball coaching mentor and I’ve learnt a lot from her. She’s a great coach and a great friend. With a promising netball coaching career on the side-lines, Tesoriero was still making an impact on the field with the Eastern Devils in women’s football. In 2016, the strong-bodied forward was one of the best contested footballers at the club, and averaged a goal a game for the Devils. And when the AFLW draft came around in October that year, Collingwood selected the 170cm Tesoriero with pick No. 107. While her childhood dream came to fruition on draft day, Tesoriero had an unorthodox method of finding out she’d been selected. “I quickly got out of there and went to the closest McDonalds for some free Wi-Fi to watch the draft on my phone. “It was a long wait and a long day, and I couldn’t sit there anymore, so I started to drive home. Despite growing up in a Sydney Swans family, when it was announced she’d be donning the Black and White stripes, Collingwood’s No. 7 was able to reflect on a special connection close to her heart. Having seriously considered retiring from sport if she hadn’t been drafted, representing Collingwood has been what she describes as a “second wind” and a revival in her sporting career. “When I went to Ireland years ago, the entire community was right behind me. They funded that trip and to see them supporting me again at Collingwood is just incredible. Tesoriero says her favourite player growing up was Sydney’s Paul Kelly. But it’s an opposition AFLW player and a new teammate of hers who have become her newest inspirations. “At the Eastern Devils, our biggest rival was Diamond Creek, but most of those girls have now become my closest mates at Collingwood. After being dropped following the loss to Carlton, Tesoriero returned to the team in impressive form and has emerged as one of the leaders in the midfield. Off the field, Tesoriero works in parks and gardens, but admits most people are more interested in her unique hairstyle. “I’ve been considering getting rid of them, but thought I’d better hang on to them as the fans might like a player with crazy hair. 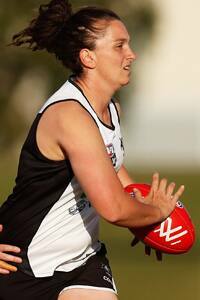 To have any chance of making the last game of the AFL Women’s Competition, the Magpies will need to secure back-to-back victories when they take on Fremantle at Rushton Park in Western Australia on Saturday. “Last week was an unbelievable experience. To get that win, and to give something back to the fans and the club who have invested so much in us was rewarding.